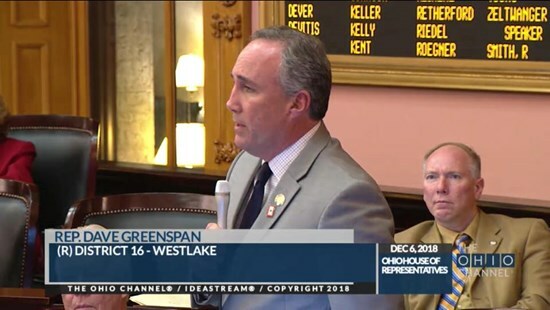 I am honored today along with my colleague Rep. Brigid Kelly to Introduce Legislation to Legalize and Regulate Sports Gaming in Ohio and Provide Additional Public Education Funding. 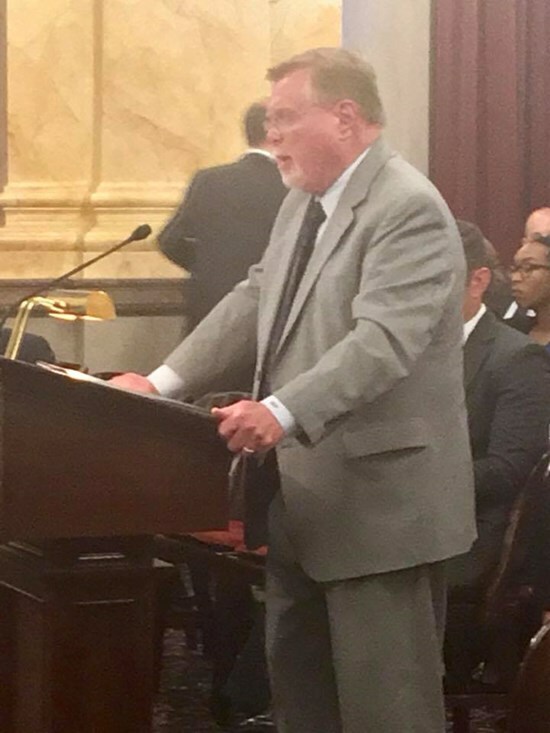 Thank you Chair Schaffer and members of the House Ways and Means committee for the opportunity to give sponsor testimony on legislation that would increase the time within which property tax complaints must be decided and to change the name of the Ohio Legal Assistance Foundation to the Ohio Access to Justice Foundation. 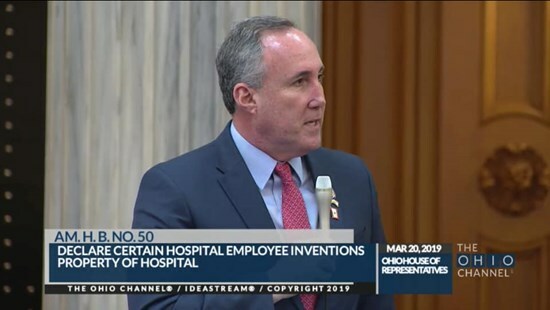 Thank you Speaker Householder and my colleagues for the unanimous passage (93-0) of this important legislation that would declare certain hospital employee inventions, discoveries, or patents are the property of the charter county hospital. 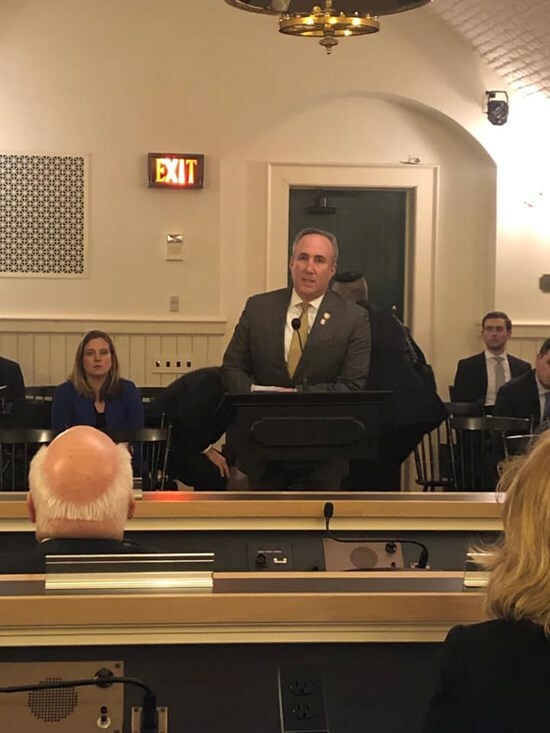 Thank you Chair Hambley and members of the House Civil Justice Committee for the unanimous passage of this important legislation that would declare certain hospital employee inventions, discoveries, or patents are the property of the charter county hospital. Thank you Chair Bacon and members of both the House and the Senate for the passage and concurrence of HB 38 (Public Safety and Military Protection Act). I am especially proud to say this is my first piece of legislation introduced as a State Representative. This bill will provide necessary protections to the men and woman who put their lives on the line for us each and everyday. 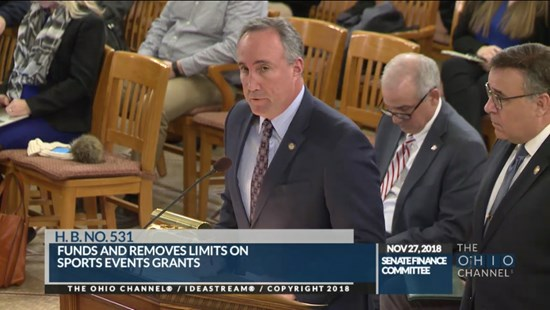 Thank you Senate Finance Chair Oeslager, my joint Sponsor Speaker Pro Tempore Schuring and members of both the House and Senate for the passage of HB 531 (Fund and remove limit on sports events grants). 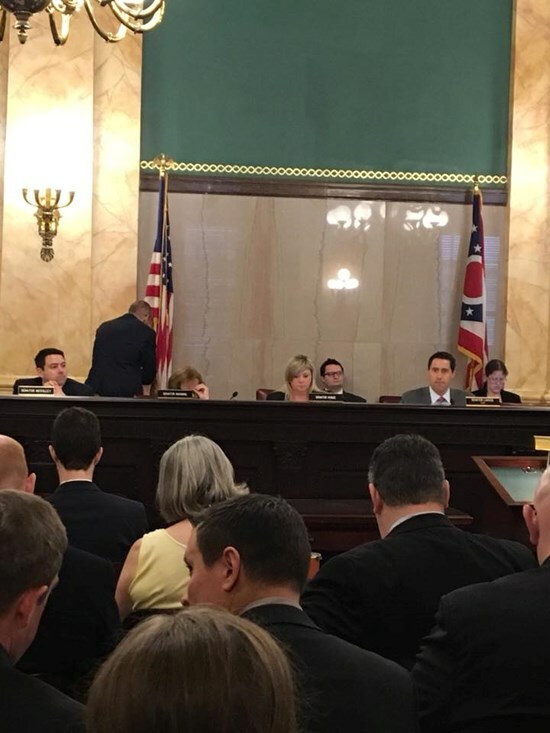 Thank you Chair Coley and members of the Government Oversight and Reform committee for the unanimous passage of HB 453 (Declare inventions at county hospitals to be hospital property). Thank you Chair Oeslager and members of the Senate Finance committee for hearing House Bill 531 for both Sponsor and Proponent testimony. 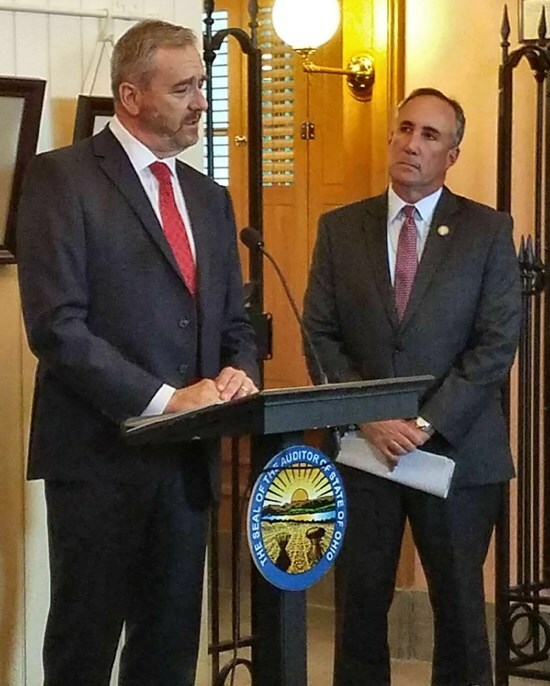 I would also like to thank my Joint Sponsor Representative Kirk Schuring and all of the proponents for their continued work on this piece of legislation. 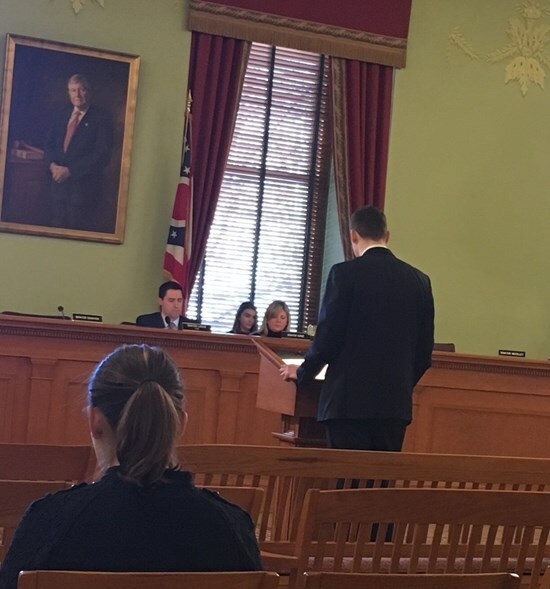 Thank you Chair Lehner and members of the Senate Education committee for hearing HB 360 (Ohio Anti-bullying/hazing Act) for proponent testimony. I’d also like to thank proponents Stuart Muszynski, Richard Hronek, Melanie Moore, and Reverend Morris accompanied by his daughter who is a victim of bullying. 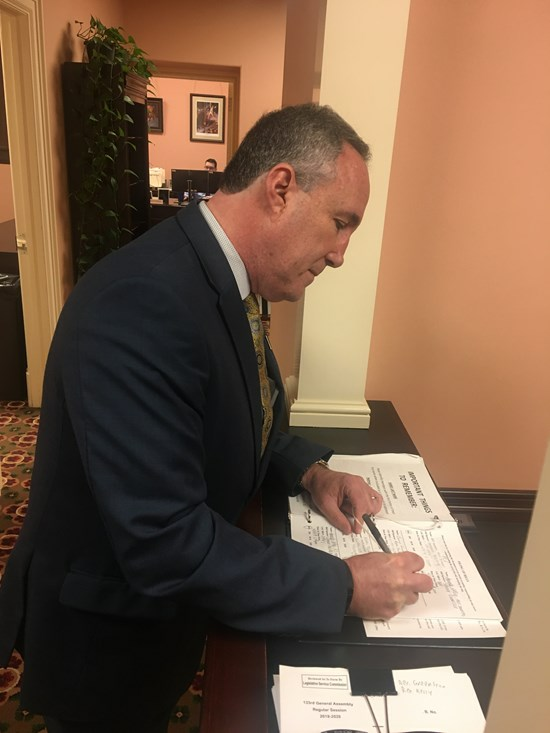 I am humbled that our bipartisan bill that I co-sponsored with Representative John Barnes, HB 336 was signed into law today, which creates an amnesty program for driver's license reinstatement. Thank you to all of my colleagues that assisted with this important piece of legislation. 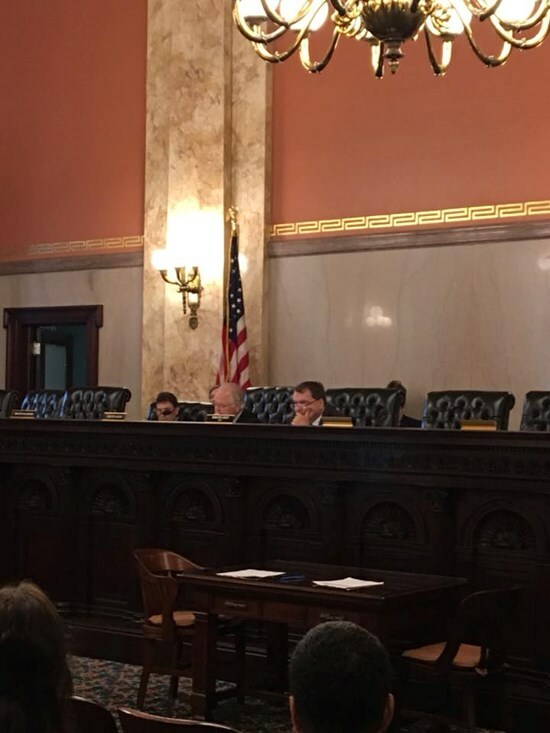 Thank you to the Ohio Senate for the unanimous passage of House Bill 312. 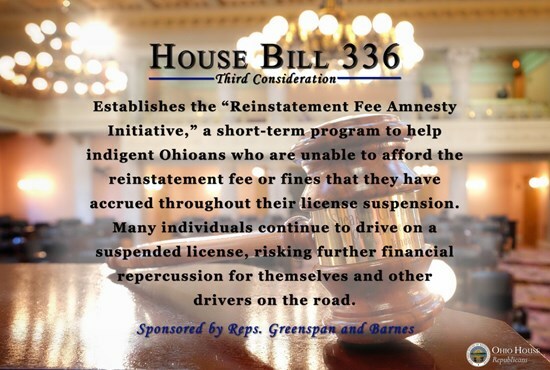 Thank you to the Ohio Senate for the unanimous passage of House Bill 336. Thank you Chairman LaRose and members of the Senate Transportation, Commerce and Workforce committee for favorably passing House Concurrent Resolution 10. 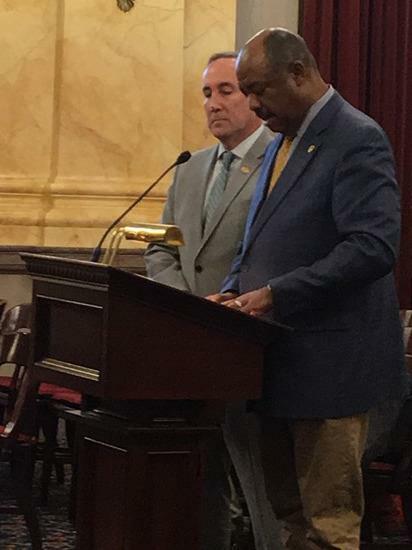 Thank you Chairman Coley and members of the Senate Government Oversight and Reform Committee for favorably passing House Bill 312. 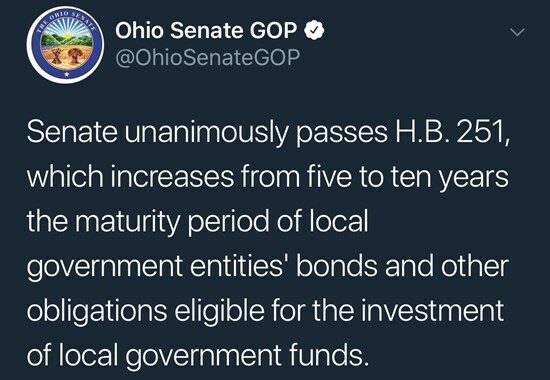 Thank you to my colleagues in the Ohio House of Representatives for the 81-7 passage of HB531. 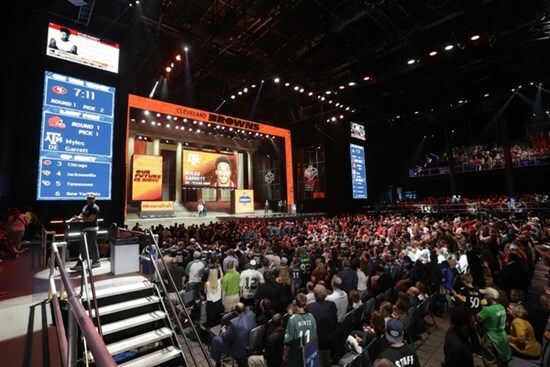 Helping Ohio attract national and global sporting events. Thank you to Chair LaRose and the Senate Transportation Committee for passing House Bill 336. 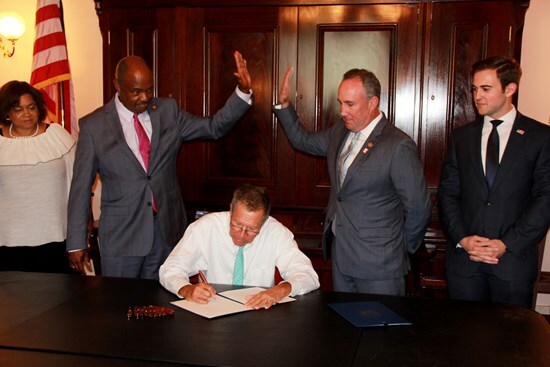 A bill that Representative Barnes and I sponsored that will help Ohioans maintain a job and get back to work. 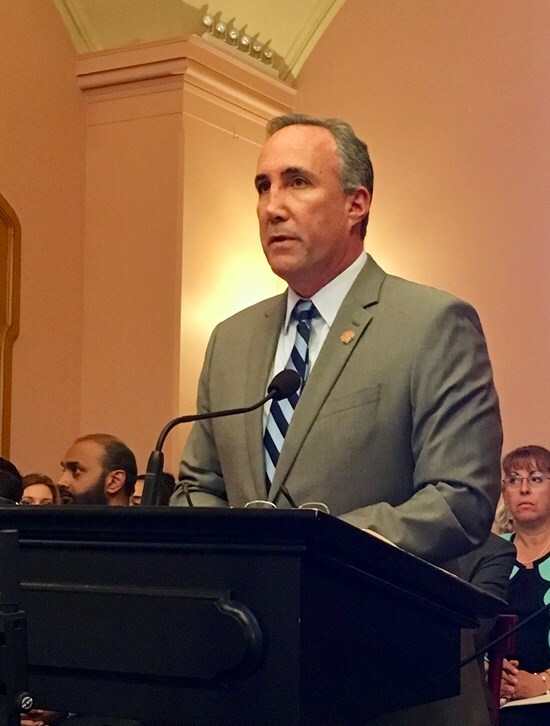 Thank you Chairman Bacon and members of the Senate Judiciary Committee for hearing HB 276 and Paul Talboo from Dominion Energy testifying in support of this important piece of legislation. 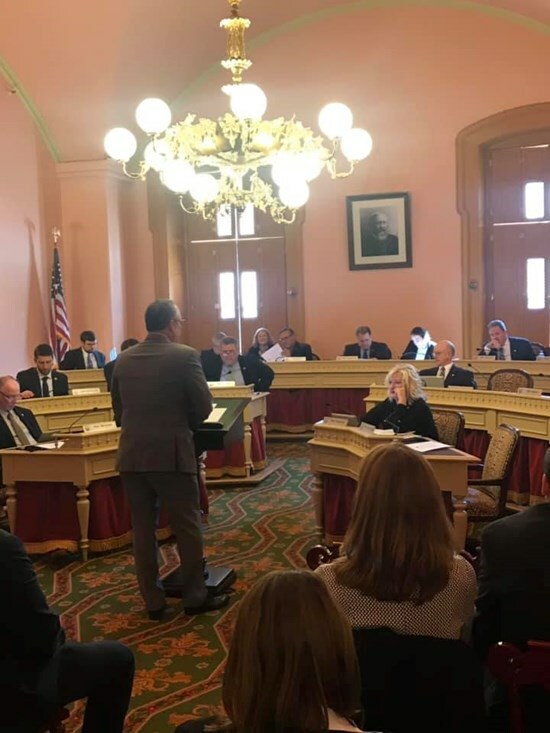 Thank you to Chair Blessing and the House Government Accountably and Oversight Committee for passing HB531 which will help Ohio attract major sporting events. Thank you Chairman Coley and members of the Senate Government Oversight and Reform Committee for hearing HB 453. I’d also like to thank the Chief Legal Counsel of Metro Health Mike Phillips for providing proponent testimony. 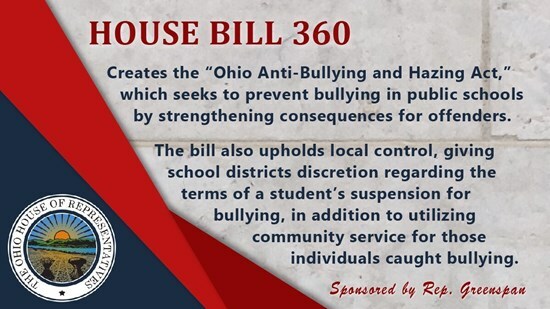 Thank you to my colleagues in the Ohio Senate for passage of HB 251. 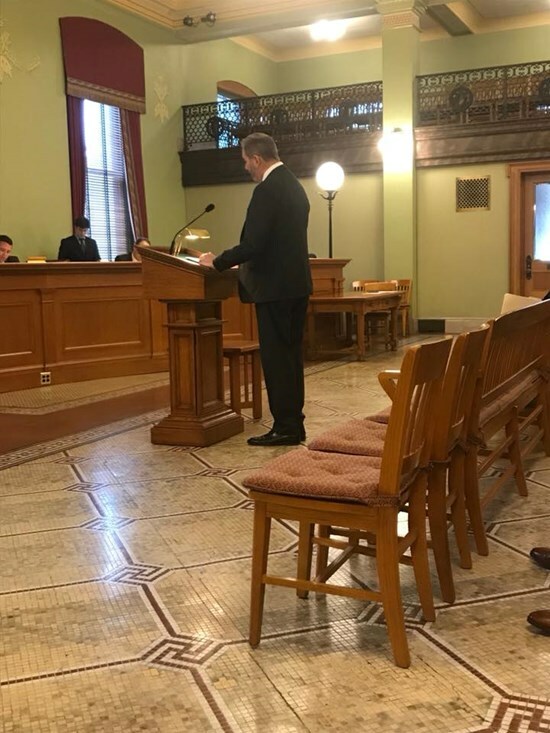 Thank you Chairman Blessing and the Government Accountability and Oversight committee for allowing me the opportunity to provide Sponsor Testimony on HB 531 co-sponsored with Rep. Schuring which will fund and remove limit on sports events grants. 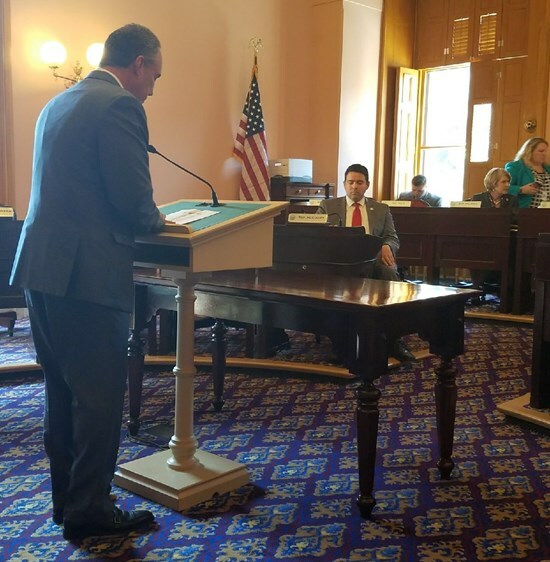 Auditor Dave Yost Providing Proponent Testimony to HB 312: Regarding credit and debit card use by political subdivisions today in the Senate Government Oversight and Reform Committee. Thank you to my colleagues who voted 90-2 in favor of House Bill 453! 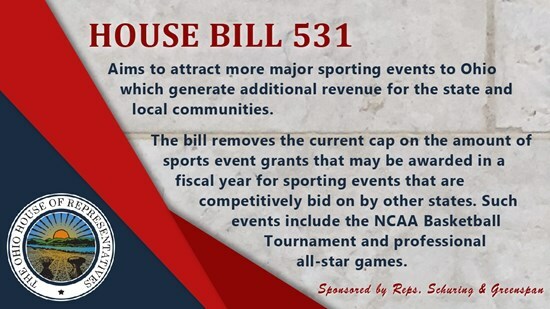 Coverage on a bill the Rep Schuring and I have joint sponsored that will provide funding for major sporting events coming to Ohio. Click the below photo for the entire coverage. 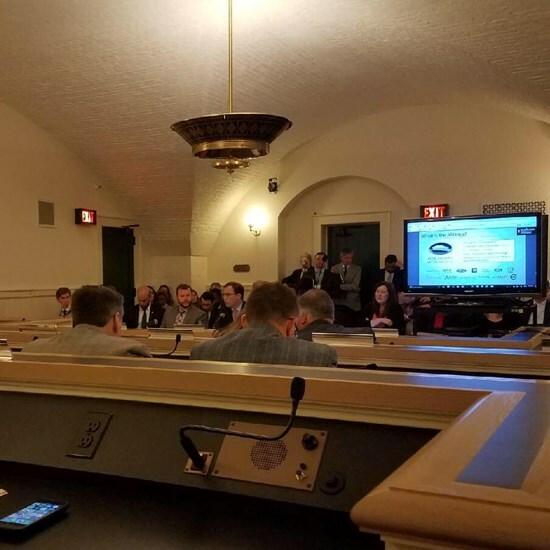 Thank you to my colleagues in the Ohio House of Representatives for passing HB 415 today which gives meaningful support to our local communities to take care of the roads, which are especially in need after a cold winter. 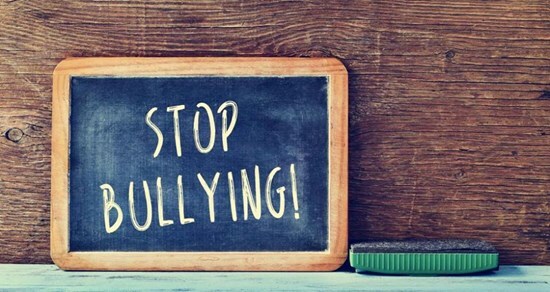 The Ohio House of Representatives Transportation and Public Safety Committee voted unanimously today to support a bill that Representative Fedor and I joint sponsored that would raise money to support anti-bullying educational activities. Thank you to Chair Green and members of the committee. 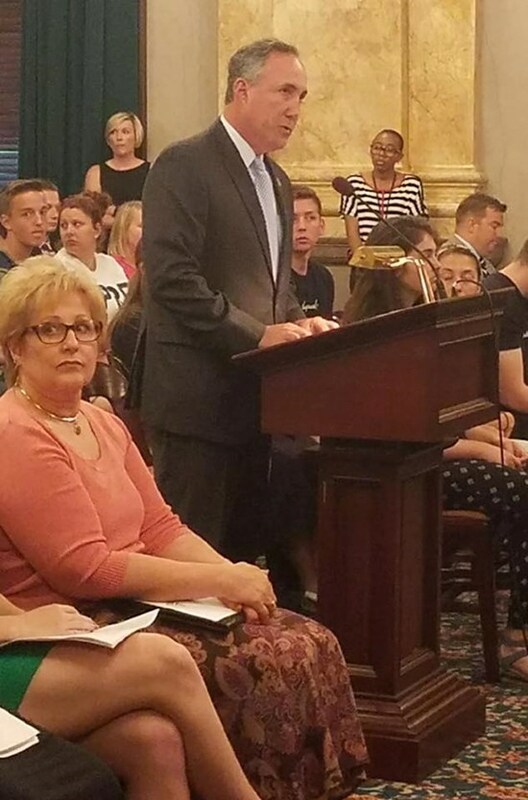 Thank you to Chair Brenner for the opportunity to provide information about House Bill 360 as a potential sub bill was called by the House Education & Career Readiness Committee. Thank you to Chair Oelslager and the Senate Finance Committee for unanimously voting HB 251 our of committee today. Below is a summary of this important piece of legislation. House Bill 336 was heard today in the Senate Transportation Committee. The bill provides a pathway to re-instate suspended drivers licenses. 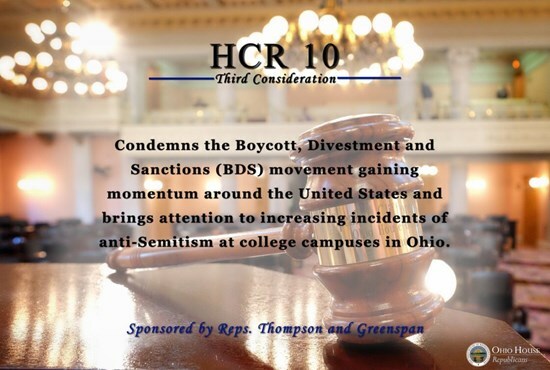 I wish to thank those who came out today in the Ohio Senate in support of HCR10- a resolution to support free speech and for the support of the State of Israel. 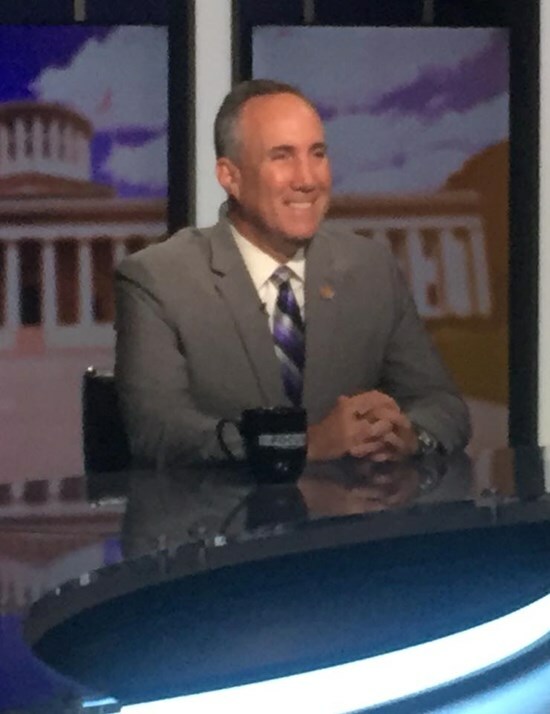 Coverage from the Newark Advocate regarding HB415 which will allocate one-half surplus revenue to local road improvements that I am proud to co-sponsor along with my colleague Representative Scott Ryan. 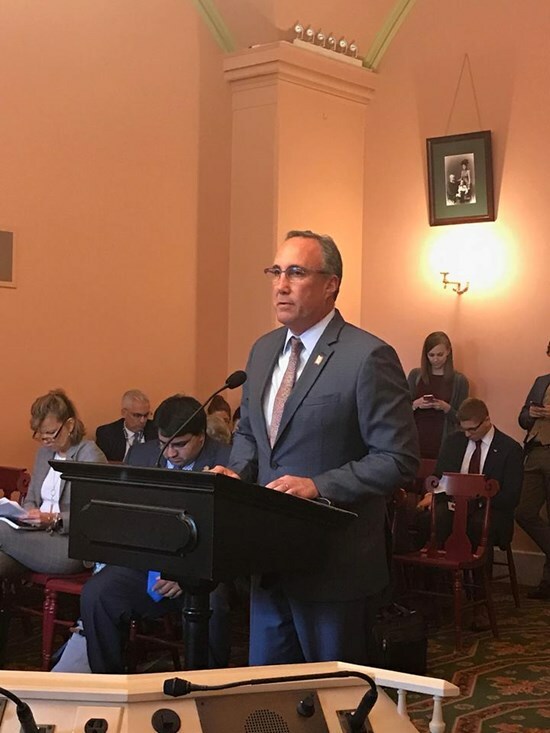 I wish to thank Chair Anielski and members of the House State and Local Government Committee for their unanimous support for a bill that I have sponsored- House Bill 453. This bill provides protection to County hospitals as they innovate intellectual property. 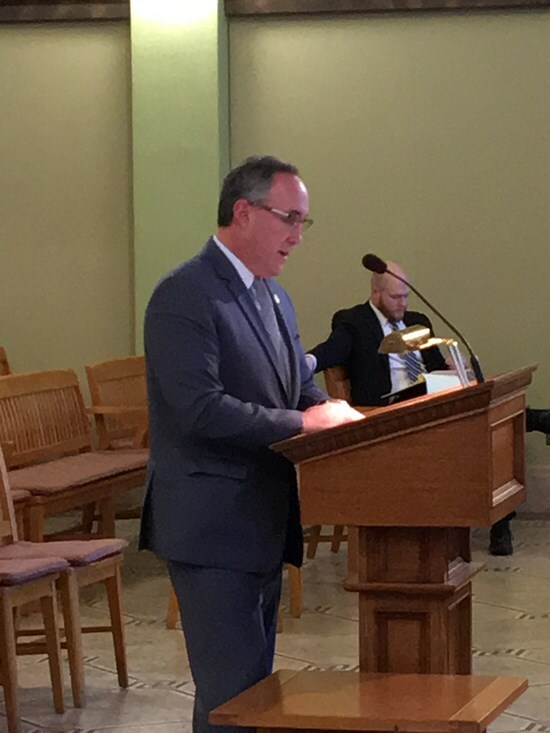 Today Representative Andy Thompson and I had the privilege of addressing the Senate Transportation, Commerce & Workforce Committee regarding HCR 10 which will condemn manifestations of anti-semitism. Thank you to Chair LaRose for the opportunity. 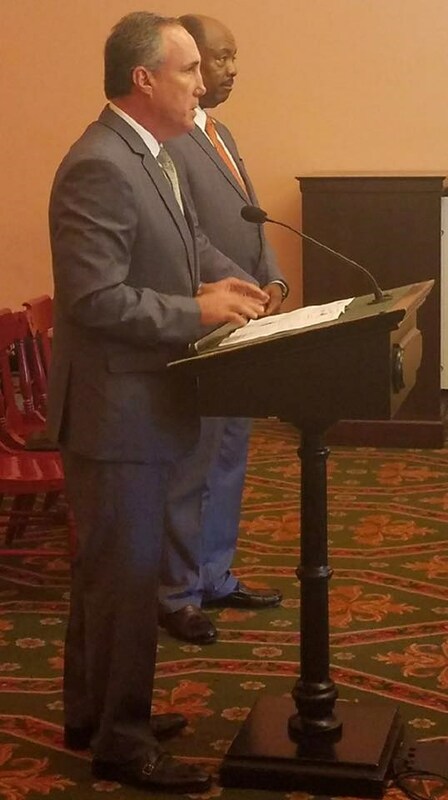 Today Representative John Barnes and I had the privilege of addressing the Senate Transportation, Commerce & Workforce Committee regarding HB 336 which will create driver's license reinstatement fee amnesty initiative. Thank you to Chair LaRose for the opportunity. Thank you to Chair Marlene Anielski and the members of the House State and Local Government Committee for unanimously voting out to the floor HB 415 which will provide funding to our Counties, Cities, Villages & Townships for roads. 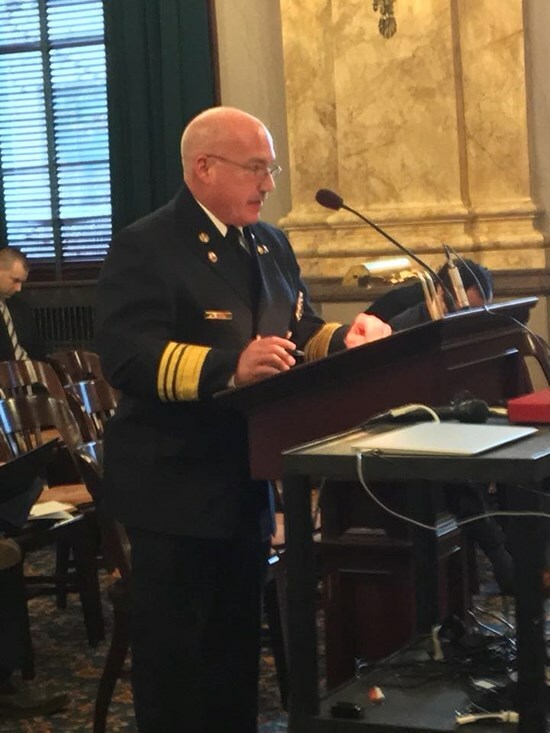 Thank you to Ohio Fire Chiefs' Association President William Houk for providing proponent testimony to the Senate Judiciary Committee today regarding HB 38 “The Public Safety and Military Protection Act”. 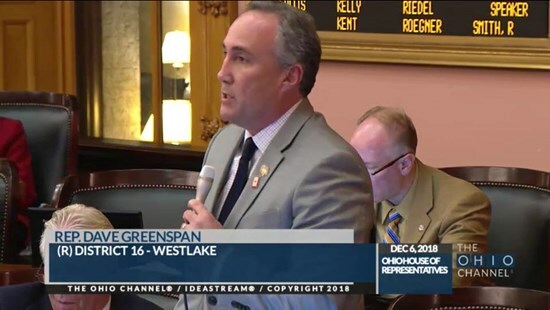 Thank you to my colleagues in the Ohio House House of Representatives for passing HB 276 today 89-3. 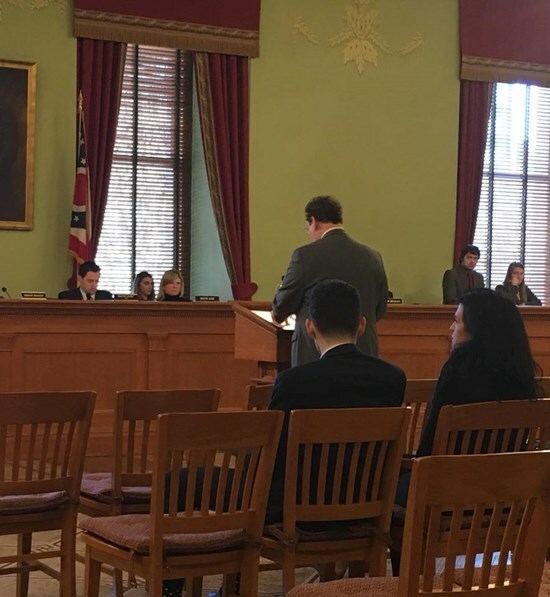 Thank you to the members of Senate Government Oversight & Reform Committee for the opportunity to provide sponsor testimony on HB312 which regards credit and debit card use by political subdivisions. 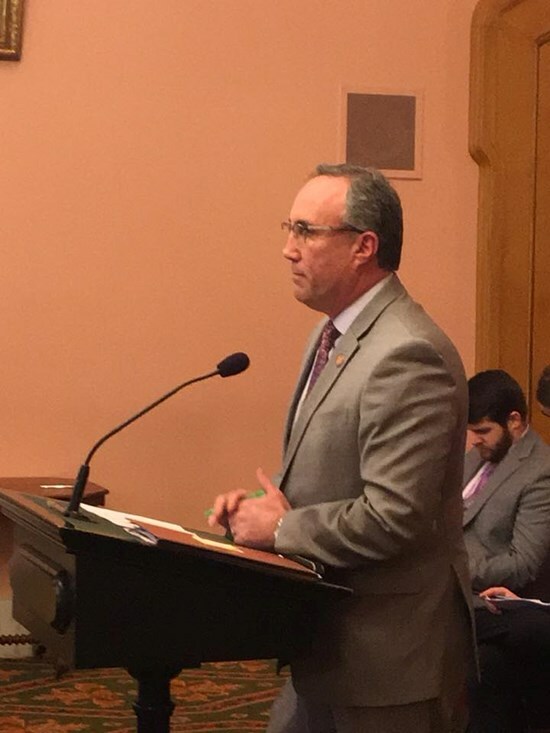 Thank you to the Senate Finance Committee for the privilege of speaking to you today regarding HB251 which will Increase maturity of bonds eligible for investing interim money. 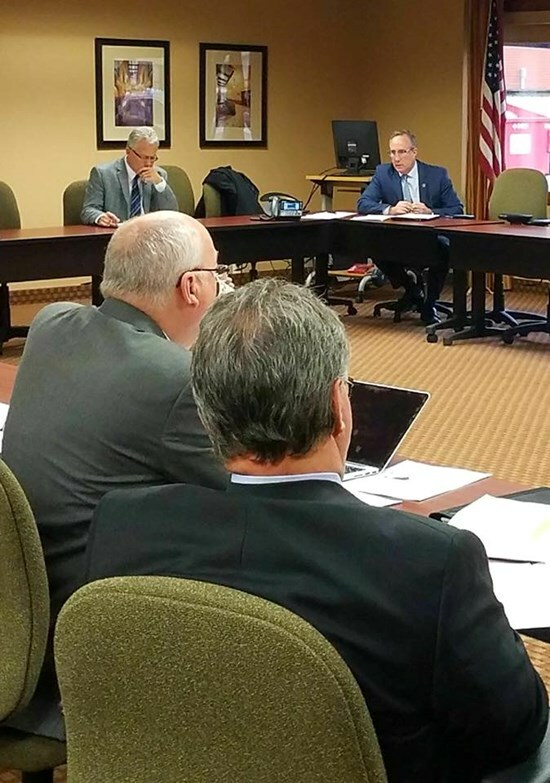 Thank you to the members of the Tax & Finance Committee for the County Commissioner's Association of Ohio for hosting me to discuss House Bill 415. 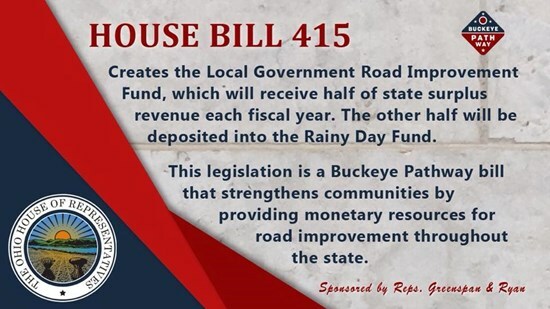 House Bill 415 increases much needed revenue to our local partners across Ohio and I am humbled that the committee voted to support the bill. 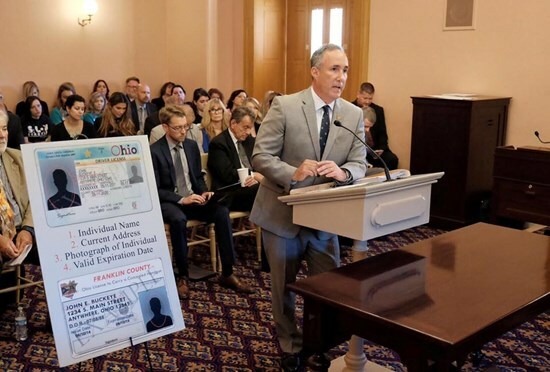 Coverage of House Bill 453, which I proudly sponsor. This legislation would require that all rights and interests in discoveries, inventions or patents made by employees using charter county hospital facilities are the property of that charter county hospital. 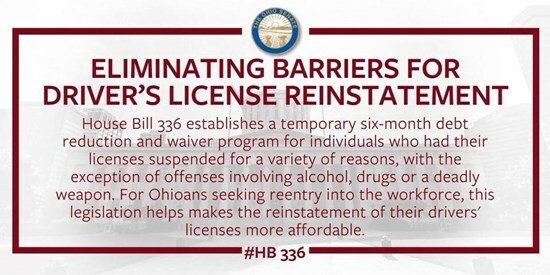 HB 336 passed today in the Ohio House of Representatives. 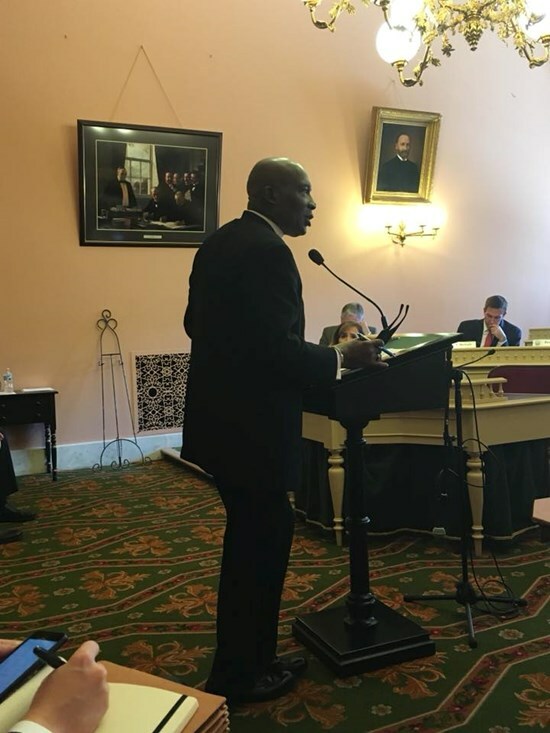 Thank you to my colleagues for their support of this important legislation that I had the privilege of being a joint sponsor with Representative John E. Barnes Jr.
HCR 10 passed today 92-2 in the Ohio House of Representatives. 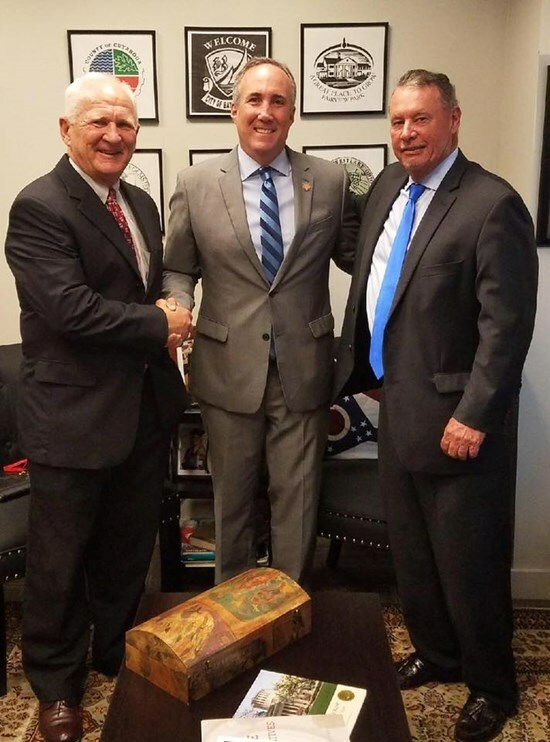 Thank you to my colleagues for their support of this important legislation that I had the privilege of being a joint sponsor with Representative Andy Thompson. 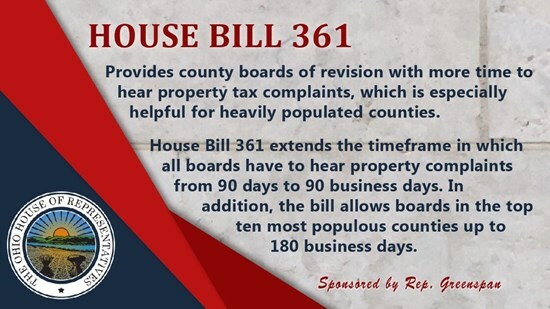 I wish to thank Chairman Blessing and the Ohio House Government Accountability & Oversight Committee for passing out of committee House Bill 331, Increase Time for Deciding Property Tax Complaints. 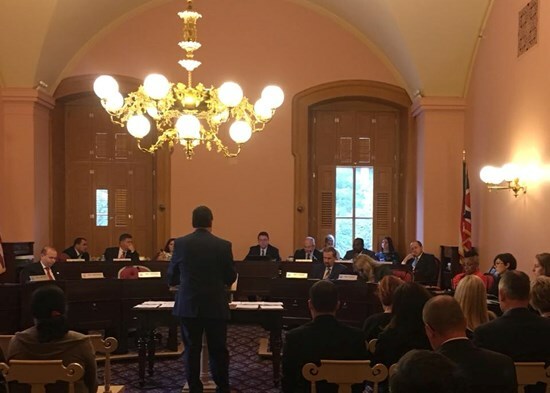 House Bill 312 passed today 90-0 in the Ohio House of Representatives. 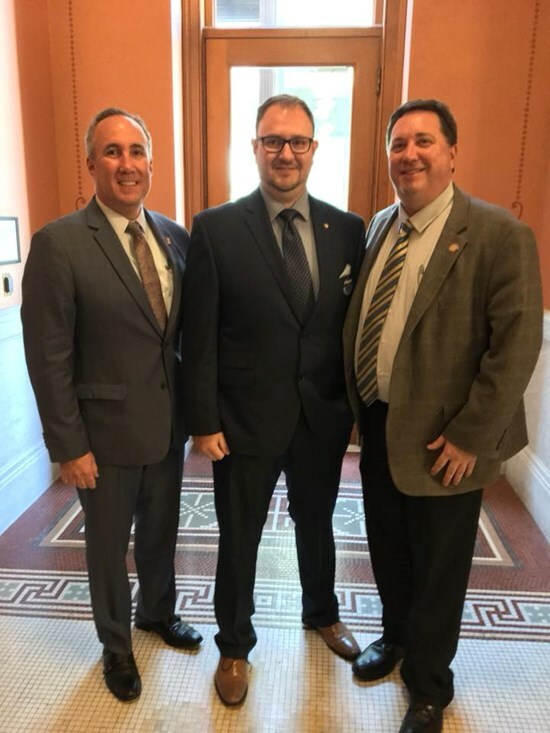 Thank you to my colleagues for their support of this important legislation that I had the privilege of being a joint sponsor with Representative Kirk Schuring. 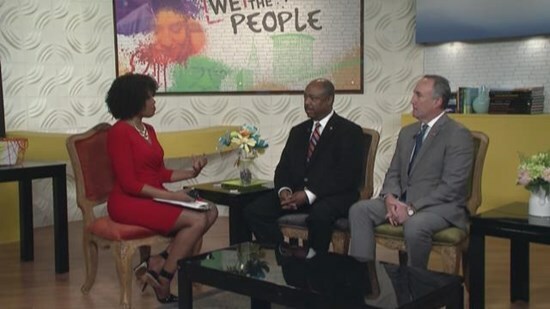 Please click on the below photo/video below to view our appearance on the We The People Show on WKYC. Thank you to Reverend Eason for providing testimony in support of our Anti-Bullying and Hazing Act today in House Education Committee. 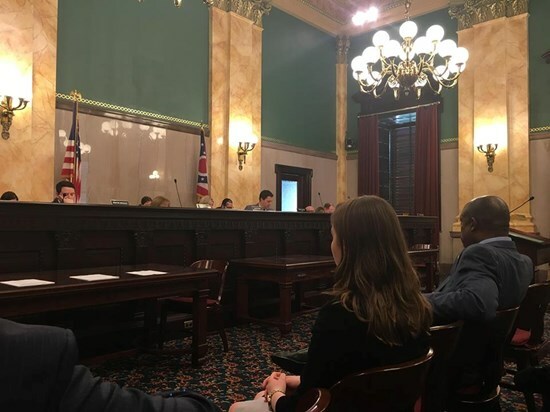 Thank you to the Education & Career Readiness Committee for the privilege of providing sponsor testimony on HB360, the Ohio Anti-Bullying & Hazing Act. Thank you to all my my colleagues today for voting unanimously in the passage of HB251. 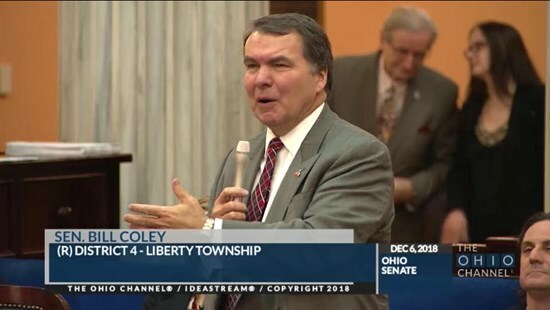 Thank you to Channel 43 reporter Harry Boomer for highlighting a very important piece of legislation that Representative John Barnes and I joint sponsored, House Bill 336. 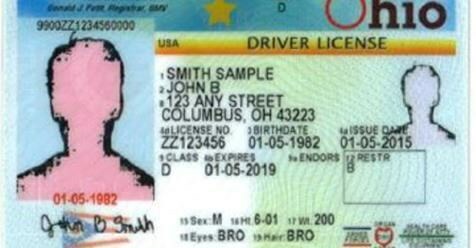 This Bill will allow Ohioans with suspended drivers licenses with a pathway to become legal and insured drivers. 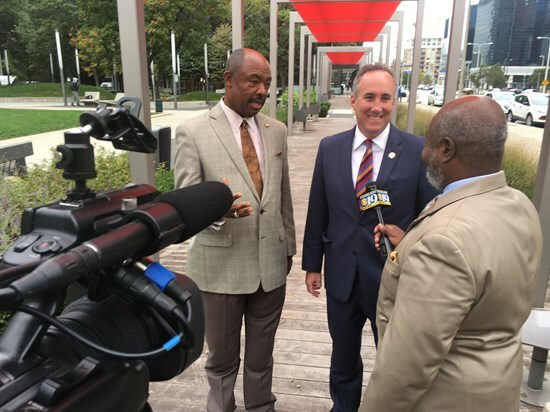 This segment will air Sunday October 29, 2017 at 6:30pm on the WUAB 43 Forum, a public affairs program covering community issues. 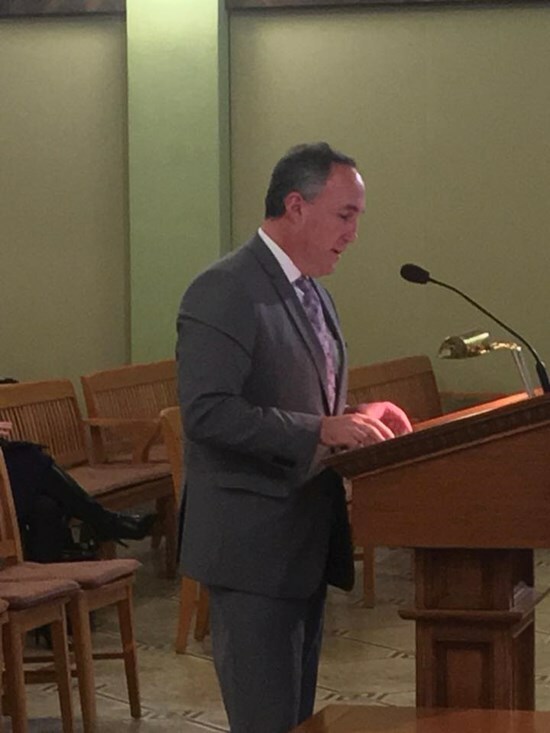 Thank you to Chairman Blessing and my colleagues on House Government Accountability and Oversight Committee for allowing me the privilege of testifying as the Sponsor of House Bill 361 which provides for greater compliance for county boards of revisions. 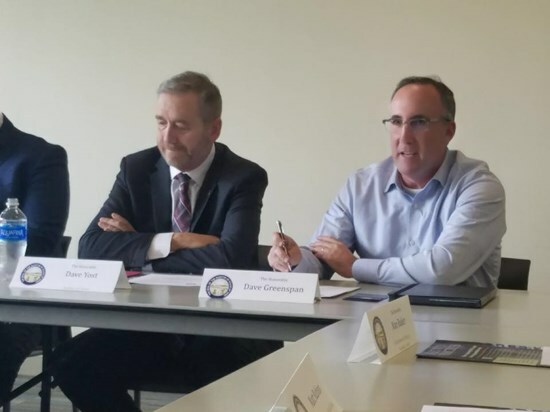 Great speaking with Auditor Yost at his Northeast Regional Advisory Board Meeting in Parma. 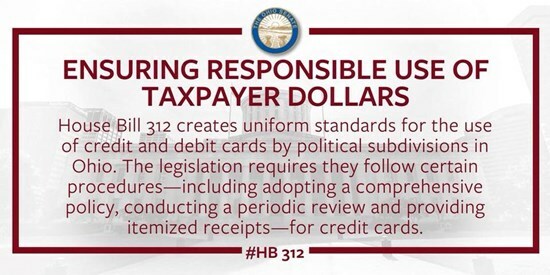 We gave an update on House Bill 312. 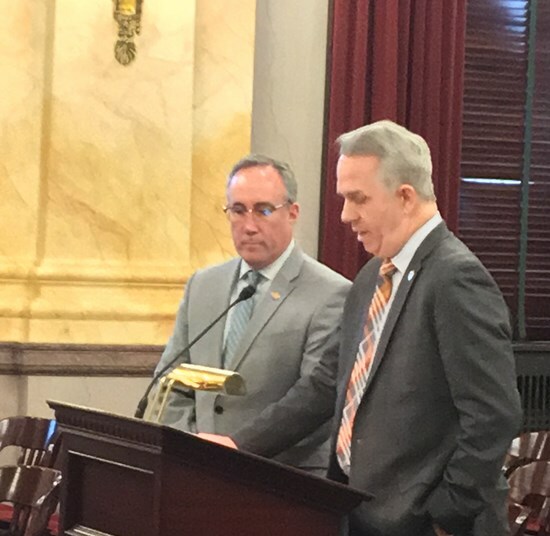 Thank you to Chair Dever and the members of the Ohio House of Representatives Financial Institutions, Housing and Urban Development Committee for voting unanimously in support of my bill, House Bill 251 - which gives greater investment flexibility for our local partners. Thank you to those who participated in today's Transportation and Public Safety Committee Meeting special hearing on Autonomous Vehicles. Chair Doug Green will be hosting monthly hearings about the industry and its impact on Ohio. 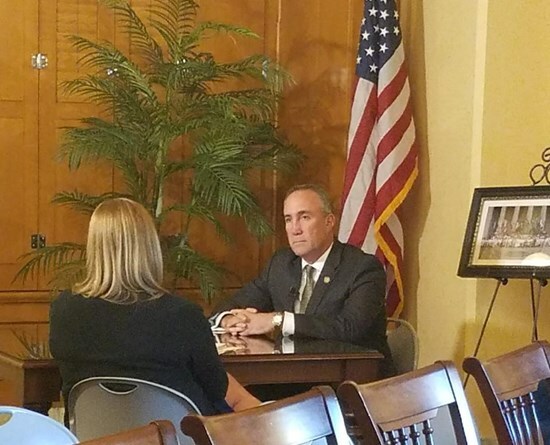 I want to thank Spectrum News and Mike Kallmeyer for the opportunity to discuss my bill - The Ohio Anti-Hazing and Anti-Bullying Act on In Focus. Thank you to Connie Luck for facilitating this interview. 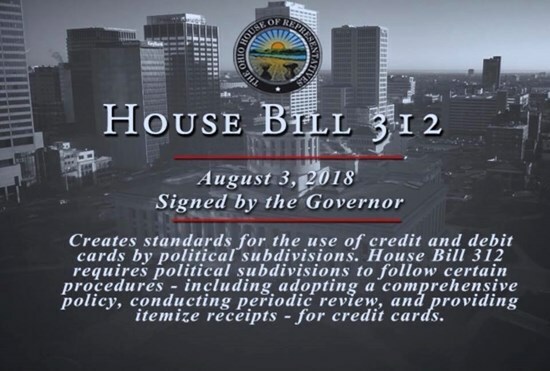 Thank you to Channel 3 reporter Tom Meyer for highlighting a very important piece of legislation that Representative John Barnes and I joint sponsored, House Bill 336. 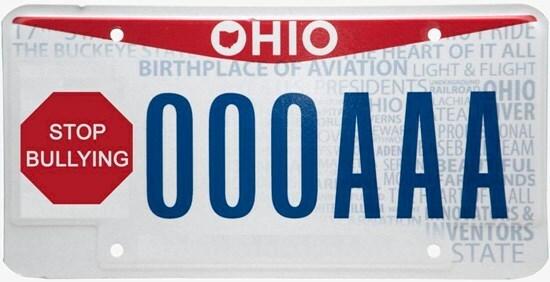 This Bill will allow Ohioans with suspended drivers licenses with a pathway to become legal and insured drivers. 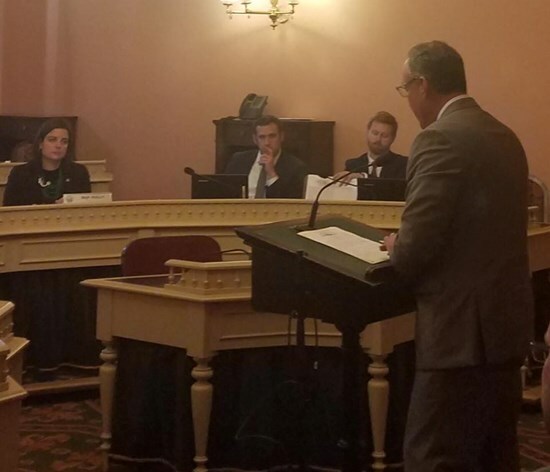 Thank you to Chairman Brinkman and the members of the House Insurance Committee for allowing Representative Barnes and me the opportunity to provide sponsor testimony on House Bill 336, the Driver's License Fee Reduction and Amnesty Initiative Act. 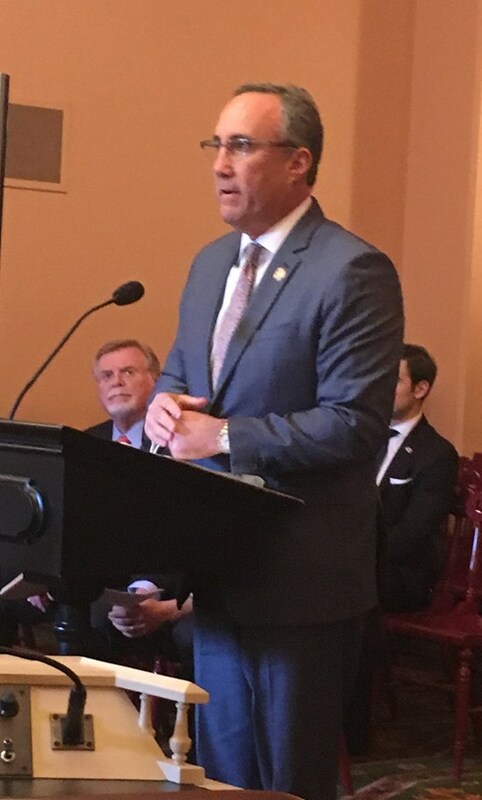 Thank to Chairman Blessing and my colleagues on House Government Accountability and Oversight Committee for allowing Representative Kirk Schuring and me the privilege of testifying as the Sponsors on House Bill 312 which protects taxpayer dollars. 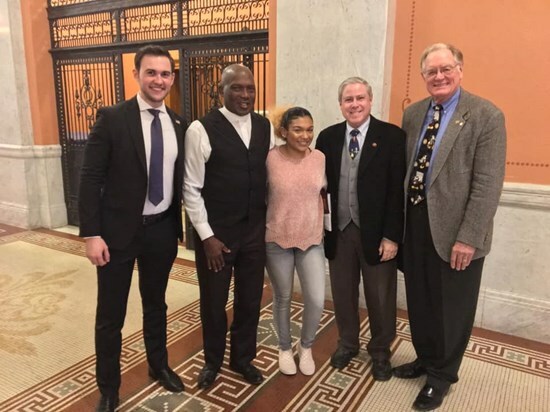 Thanks to both Cuyahoga County Fiscal Officer Dennis Kennedy and Cuyahoga County Councilman Jack Schron for driving down to Columbus today to provide proponent testimony on House Bill 251! Thank you to Mike McIntyre and 90.3 WCPN for having myself and Stuart Muszynski, President & CEO, Values in Action Foundation on your show today to discuss The Ohio Anti-Bullying Bill. 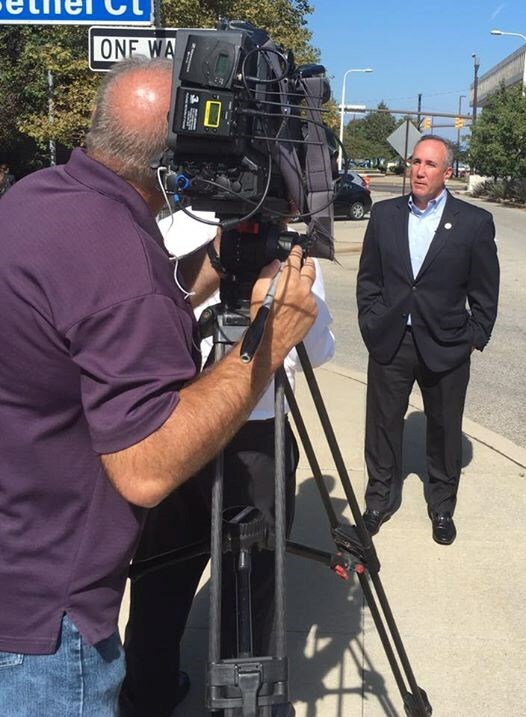 Thank you to Auditor Yost for inviting me to speak about the importance of HB312 for our local communities. I am honored to be a joint sponsor of this important legislation along with Representative Schuring. Thank you to Chairman Bacon and the rest of Senate Judiciary Committee for the honor of testifying this morning on The Public Safety and Military Protection Act. 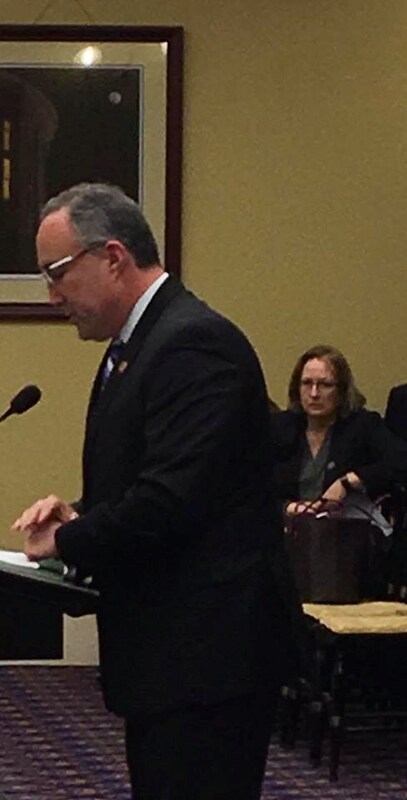 Thank you to Chairman Blessing and the rest of House Government Accountability and Oversight Committee for the honor of testifying on House Bill 222 which would allow a concealed handgun license holder to use their permit as a formal form of voter photo identification.